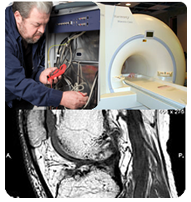 Providian Medical Field Service has everything you need to maintain, repair, or service your Ultrasound Equipment, Ultrasound Probes, PET/CT Scanners, MRI Equipment and other imaging modalities. Our unique repair, maintenance, and service contracts are unparalleled in the industry, with the most innovative methods that can reduce your downtime to less than 24 hours. Our top-rated programs, including our unique industry leading loaner and rental program. Through these programs, we offer our customers a cost-effective solution for service and repair of your imaging equipment. All the while, we minimize your downtime to a level that’s unparalleled in the industry. If you are looking for a cost-effective means of servicing and repairing your ultrasound systems without the risk of down time and lost revenue then you are at the right place. Providian has developed an in-house repair and maintenance department as well as a large network of system specialists located throughout the United States and abroad. We offer both on site repair and repair and return services on most ultrasound systems, probes/transducers, circuit boards, power supplies, VCR’s, multi-format cameras, and printers. Our loaner and rental programs are offered for CT, MRI, and ultrasound equipment with more than $2 million of inventory reserved for our Providian Medical Field Service offerings. Providian Medical Field Service is ready to assist ultrasound users with unanticipated equipment failures. The program is available around the clock. Providians technicians assist our customers by providing a cost effective alternative to manufacturer parts and labor. Please contact us by e-mail or phone at 866-443-3246 to discuss your specific ultrasound probe or ultrasound transducer repair needs or to schedule service or repair on your existing ultrasound systems, equipment, parts, peripherals, and/or transducers. Providian Medical’s Field Service department also offers service contracts to keep your ultrasound equipment in great shape, even if you didn’t buy it from us.